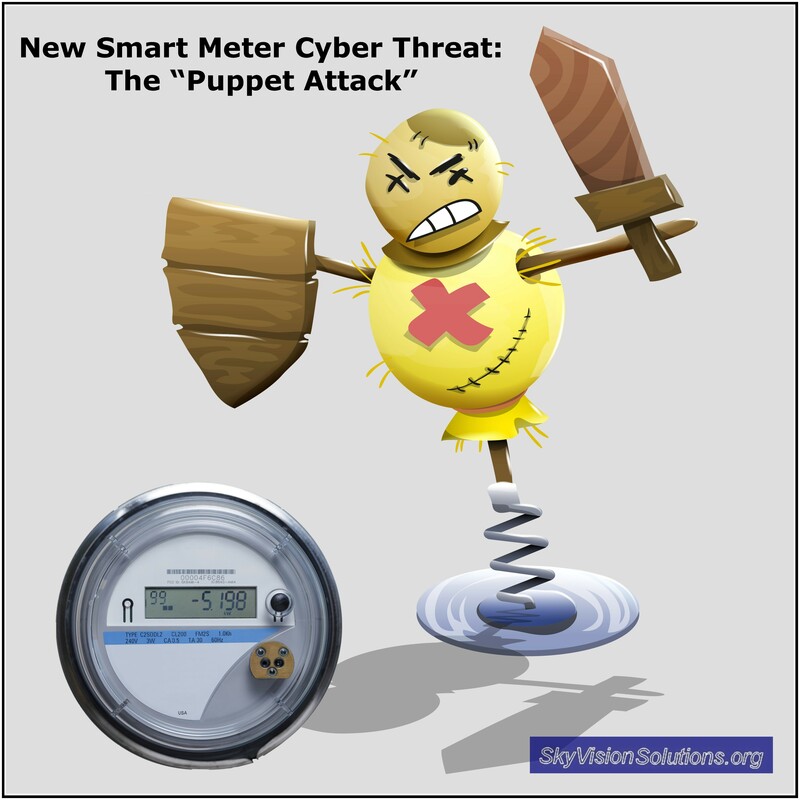 The more obvious solution is to stop deploying smart meters that utilize the flawed technology, since as the authors stated, “security threats grow exponentially” when using networked smart meters. This entry was posted in Smart Grid, Smart Meters, and RF Emissions and tagged Cyber Threat, Denial of Service, Puppet Attack, Smart Meters. Bookmark the permalink. No concrete discussion about the construct of the network being tested. The definition of what a “Normal Node” is or what the “the flawed technology” tested was? Where did it come from, what were the test conditions, etc..
At this website we frequently highlight published documents and studies that reveal that smart grid technology has risks to society and not just benefits. As the published paper in this case is copyrighted, we only summarize the main points of the study and offer a few selected quotes. In reviewing the actual published paper that I purchased, you are right in the sense I do not see a specific definition for “normal node.” However, there is discussion of normal nodes and malicious nodes within an AMI network, … and how a normal node can act as a malicious node. The reference to the technology being “flawed” is my own as the authors of the paper state that the “security threats grow exponentially” when using networked smart meters, particularly for wireless networks. There is not much hope of ensuring security under such circumstances, and thus I consider such technology as fundamentally flawed. Why would anyone want to deploy technology where the security threats grow exponentially? Oh, boy…a DoS attack…that could potentially crash the whole network. Wonder if analog meters would still get juice? We are in a very dangerous state of affairs.. The Government has failed to recognize the failures of the implementation of these device’s in the end will show to be covert and serve a greater purposed for deception to what extent we don’t know but with every passing day it is being revealed.I personally believe these device’s will be used to target every citizen in the USA. We are no longer living private lives we are under surveillance 24 hours a day. We can only hope pray our government will come to it’s sences and halt this evil plan. Of course the other “puppet attack” is the seemingly endless one against customers by the utility puppets that seem to hold office in just about every state’s public utilities commission. The paper concludes that “after developing many prevention techniques, wireless ad-hoc sensor networks are still vulnerable to DOS attacks.” I suppose these guys have fun dreaming up new names for their discoveries. This what’s turning out to be insidious poisoning of all humans and animals and plants such as trees leaves and trees bark protective coating as now verified by Holland’s top foresters has been going on for years now from the totally out of control Microwave Industry and Electric Power Company C.E.O’s and seemingly Earth’s governments with their Rapine Greed for ever more taxes, or monetary profit. As well as the steady poisoning of animals = people’s pets and farm animals and insects such as honey and bumble bees and lady-birds that usefully kill aphids the sap-sucking insects etc. It’s DEATH to all LIFE on Planet Earth my son, and the dopy and selfish and money crazy governments of Planet Earth don’t give a tinker’s CUSS. It’s now time to rip out all dopy Electric Microwave A.M.I broadcasting and receiving machines such as the dopy and poisonous and far from Smart Meters. This also calls for cutting of the powerful Electric feeder lines to the control boxes on the very high Towered Microwave sending and receiving machines for dopy and also poisonous hand held Mobile Stupid Microwave Mobile Phones. Next we all need to get these filthy poisonous towers pulled down and the same sending and receiving machines on tall buildings. I say pull down these tall towers and all of the Microwave machines atop of them and melt them down in industrial furnaces. Get rid of Wi-Fi in all schools world-wide, just as the French Education Department have been now doing for a long time as Wi-Fi in Schools or at home or at work and in trains and buses and in large passenger aircraft and large ships is poisoning humans and all of life. 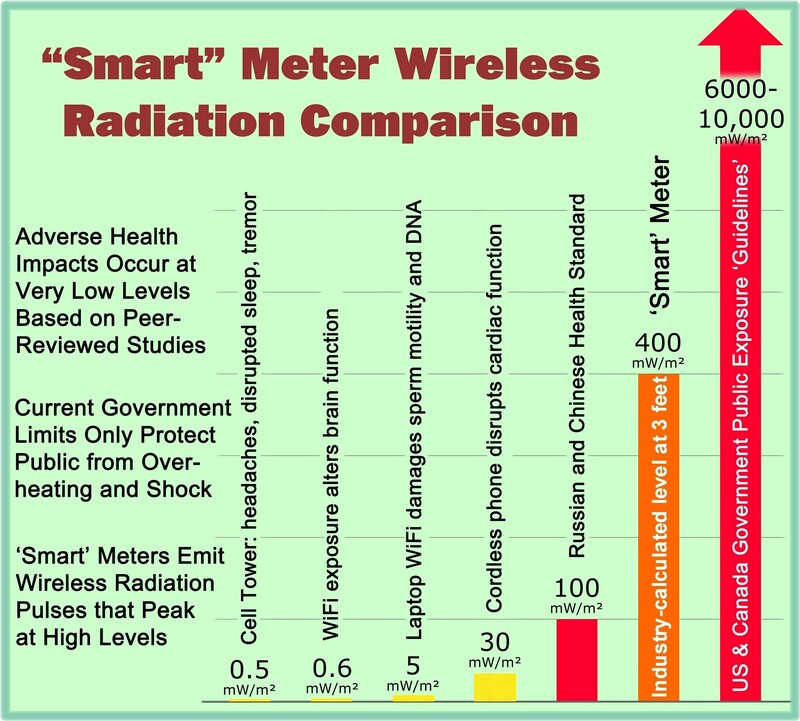 Last of all get more Safe and Passive Analog Electric Meters manufactured to replace the stinking filthy poisonous and far from Smart Microwave A.M.I broadcasting machines still on and in ever more peoples homes or on their outside walls of their homes. Also bring back the Electric and Gas and Water Meter Reader Men. Government and Electric Power Company’s Greed for ever more monetary profit has gone completely off the rails and is the height of Wickedness.